Front view of the 70-meter (230-foot) antenna at Goldstone, California. 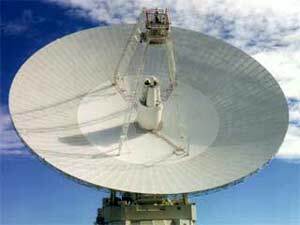 The 70-meter diameter antenna is the largest, and therefore most sensitive, DSN antenna, and is capable of tracking a spacecraft travelling more than 16 billion kilometers (10 billion miles) from Earth. View of the Canberra Complex showing the 70-meter (230-foot) antenna and the 34-meter (110-foot) antennas. 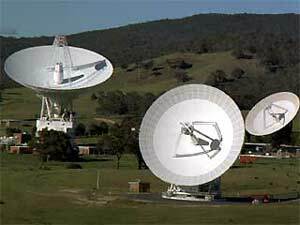 The Canberra Deep Space Communications Complex, located outside Canberra, Australia, is one of the three complexes which comprise NASA's Deep Space Network. The other complexes are located in Goldstone, California, and Madrid, Spain.